A minor accident with a bicyclist. A police officer who allegedly lost his memory. 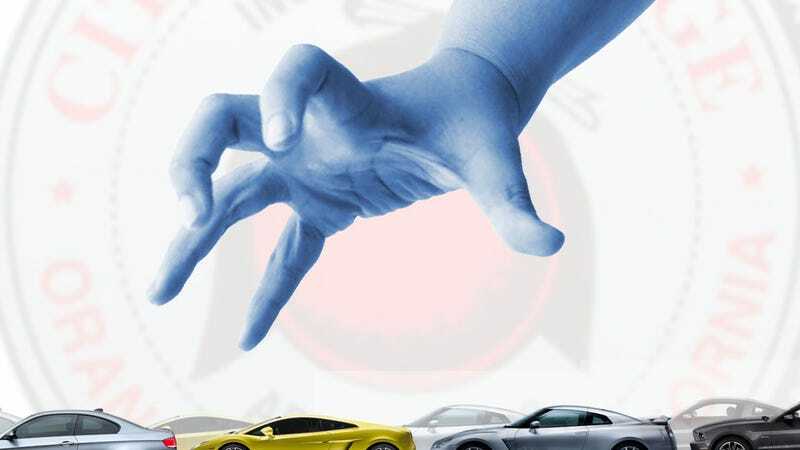 Seventeen cars, mostly sports cars including exotics like a couple of Lamborghinis and a Nissan GT-R, impounded for more than 100 days with no explanation given to their owners. It’s a deeply baffling story unfolding in the small town of Orange, California, and so far no one has answers. As of now, no official report has been filed regarding the initial incident or the subsequent impounds. Though the cars are impounded, they have been seen driven (allegedly quite spiritedly) on at least one occasion by a car owner, under what Orange police officials say was “testing.” Both police and a local tow yard confirmed the impounds, but the Orange County District Attorney declined to comment on the case. Perhaps there’s a very valid reason these cars were seized; Uzzi Chowdhry does not think so. Chowdhry is one of the 17 people with an impounded car, and described the series of events that started the day after Christmas last year, with a group of friends going on a drive. Originally, this story was broken on the website of automotive software company CarNinja, where Chowdhry works as a client strategist, but Jalopnik started digging into it a little more afterward. Chowdhry said he and 16 of his friends, mostly college students, gathered for a drive on December 26 on South Jamboree Boulevard in the City of Orange. Pretty much every car in the group was a performance car of some kind; Chowdhry was in his BMW M3, one of a number of BMWs in the group. There were also Mustangs, a pair of Lamborghinis, at least one Nissan GT-R, and so on. Cars that you’d want to drive whenever you could find a reason to. Chowdhry described the scene: while driving, the lead car, a Mustang, had a minor incident with a cyclist. The cyclist swerved to avoid a tumbleweed and hit the Mustang at low speed. No injuries were reported, and damage was minor for both bike and the car. Chowdhry and his friends say they were not speeding or engaging in any illegal or reckless behavior during the drive. One driver in the convoy—whom we’ll identify as Robert because his lawyer asked him not to use his real name until legal proceedings take place, and because he feared the repercussions the incident would have on his business—corroborated Chowdhry’s version of events. He also said none of the drivers attempted to flee the scene. After the incident with the cyclist was over, Robert said they continued driving. That seemed to be the end of it. Until police started impounding the cars. Here’s where things start to get weird: according to Chowdhry, in January the drivers of the cars in the convoy received calls from the City of Orange Police Department asking about the bike crash. Officers told them, Chowdhry said, that the accident report was never actually filed by the officer at the scene, and that officer had recently suffered an accident that caused him to lose his memory—including his memory of the incident with the cyclist and the Mustang on December 26th. On the calls, police were asking the drivers a number of questions relating to the December 26 incident. Chowdhry told me he found this suspicious since three officers were present, and it’s unlikely they caught amnesia from the cop who had the accident, since, you know, that’s not how amnesia works. Chowdhry said he spoke with some of the other drivers who received calls that police would show up at their homes or schools if they did not come to the City of Orange police station to answer questions. When those drivers did show up, their cars were impounded. Police had shown up to the residences of the individuals. The scene was the same at every house: squad cars out front, police banging on the door, seizing cell phones and laptops, photographing the cars in question with their doors, hood, and trunk open, providing a show for the whole block as neighbors left for work or school. Those who weren’t home had officers show up at their workplace where they were escorted out in front of coworkers, colleagues, and bosses with hands tied behind their back. Robert said police showed up at his house on April 6 at 6 A.M. with a seizure warrant for his car. Five officers blocked off his cul-de-sac and took his car, he said. Robert even said he had just met one member of the group a week prior, and was on his first-ever cruise with them. “How is that organized?” he said, adding that he didn’t even see the bike wreck—it happened after he arrived. Chowdhry claims that the driver of the car involved in the initial incident with the cyclist has a copy of the Accident Information Exchange document that was written at the scene. It should be made clear that this is not the actual accident report, which is still forthcoming. But while Chowdhry and his attorney asked us not to publish the Accident Information Exchange form, I have seen it and can confirm that it exists. Chowdhry also showed me sections of the initial search warrant that appear to confirm that the cyclist was believed to be at fault for the collision, citing California Vehicle Code 21658(a): Unsafe Lane Change, based on statements from witnesses. Additionally, Chowdhry said that police seized a GoPro camera at the time of the event, along with a list of contact names and phone numbers of the other drivers. Again, no citations for speeding were filed at the time of the incident, and Chowdhry claims that there was no racing taking place during the drive. But the City of Orange Police Department maintains that every car was impounded within the bounds of the law. What Were They Doing On The Street? All this was already something of a mess, but for these owners, it got worse. On April 23, Chowdhry got a message via Snapchat that his car and other cars from the group were seen being driven, spiritedly, up and down the street near the impound lot where they were housed, at a business named Archie’s Towing. Chowdhry went down to the tow yard and found the street in front of the lot closed by police, and many of the cars being driven up and down the street. He described the cars to me as being “raced,” driven hard and aggressively. He took photos and video of the cars being driven, but in the process was detained (not arrested) by police officers for two hours. Chowdhry said his phone was taken, though he was able to upload some of the photos prior to the phone being confiscated. Chowdhry said he was told that “taking pictures of police activity on public roads” is illegal, which is absolutely not illegal at all. The phone has still not been returned, though I suppose that seems like nothing compared to a BMW M3. I spoke with Detective Brown of the City of Orange police department about all these events. Brown said all that the cars were all impounded legally, with a court order from a judge. As far as why the cars were impounded, when none of the drivers were cited for any infractions at the initial incident, Brown told me he knew the reason why, but could not reveal it. When I asked Brown about the alleged racing of the impounded cars by the police, he told me that was “untrue.” Brown elaborated that, yes, the cars were driven, but only “for the purposes of inspection” and that they had a supervisor there to inspect the cars. Brown elaborated on the nature of the inspections, saying that there were three criteria that the cars were being inspected for: an investigator trained in accident reconstruction was conducting steering, braking, and acceleration tests. This, of course, raises a lot of questions. If 16 out of the 17 cars impounded were not involved in any accident, why were they being tested? Also, testing for steering, braking, and acceleration sure as hell could look like having a great time hooning around in a car. I’ve done lots of dumb things in cars that I could justify by saying I was “testing” the steering, braking, and acceleration. Brown wouldn’t say when he thought the cars would be returned to their owners, or even if they’d be returned. Of the owners, he’d only say that he “doesn’t want to call them suspects,” but beyond that would venture no opinion, saying these decisions were all in the hands of the District Attorney now. After a number of attempts to reach the Orange County District Attorney’s office, we did get a response, but that response was just to say there would be no official response, and that they can not comment on the case until any charges might be filed. They declined to speculate as to when that would be. It’s possible prosecutors will have a very compelling reason why these cars were impounded, and why it was important for the police to deprive 17 people of their property. It is possible the cars were seized as part of an investigation that could lead to criminal charges against the drivers, and the cars were tested on the streets by police doing accident reenactments as part of that. But even that seems like an extreme use of resources by police over a minor traffic wreck that did not even result in any serious injuries, and for which the cars were initially not faulted. Until these owners hear what the District Attorney has to say, they simply do not know why. Robert said attorneys for the owners forced a hearing before a judge to learn more, and that hearing is set for Friday. For now there are still 17 cars sitting in an impound lot, and there’s still 17 angry, confused drivers hoping this ends well. Robert is one of them, bumming rides off friends and meeting business clients in rental cars while his car wait. “I want to make sure this is known,” Robert said. “If (the police) can do this to us, they must think they can get away with it. Correction: This story has been updated to correct a detail about the wreck with the cyclist; it involved a Mustang, not a BMW.